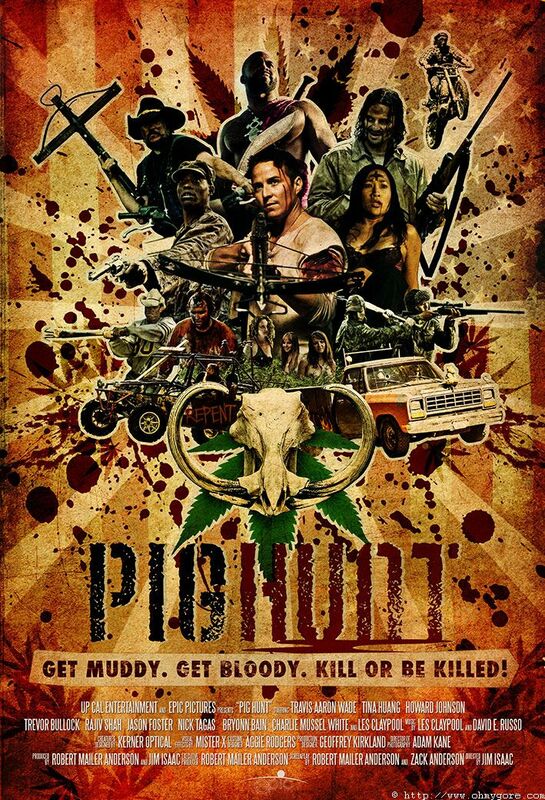 FANGORIA is hosting the West Coast premiere of "PIG HUNT", "JASON X" director Jim Isaac's action-packed horror-thriller, at the American Cinematheque's Egyptian Theater in Los Angeles (6712 Hollywood Boulevard) tomorrow night, Tuesday, May 5 at 7:30 p.m.
Isaac and his cast and crew will be attending, as well as many other special guests (see below). The event will also feature free giveaways, live performances and a few crazy stunts guaranteed to make for a memorable night. The Fango/American Cinematheque "PIG HUNT" screening will be a free show; to obtain tickets, send an e-mail by 2 p.m. EST tomorrow to fangoscreening@starloggroup.com. You must list “PIG HUNT” as your subject line. Offer is good for you and one guest; plus, tell us your full name and whether you want to be added to the FANGORIA newsletter list so we can tell you about future Fango screenings and events. Names will be checked at the door. Offer is first come, first served, and we will confirm your RSVP. Seating is not guaranteed. "PIG HUNT" cast in attendance will include: Travis Aaron Wade, Tina Huang, Howard Johnson Jr., Trevor Bullock, Rajiv Shah, Jason Foster, Nick Tagas, actor/Primus musician Les Claypool and actor/legendary blues musician Charlie Musselwhite and his band, plus director Isaac, cinematographer Adam Kane and writers Robert Mailer Anderson and Zack Anderson. Outside of the "PIG HUNT" posse, the roster of personally invited “expected” guests includes "TRANSFORMERS"' Megan Fox, Sugar Ray's Mark McGrath, "RED SANDS"' Shane West, "TAMARA"'s Jenna Dewan, "IRON MAN 2"'s Jasmine Dustin, "TEENAGE CAVEMAN"'s Andrew Keegan, "THE LAST HOUSE ON THE LEFT"'s Aaron Paul, "LEECHES"' Josh Henderson, "JEEPERS CREEPERS 2"'s Al Santos and Emile Hirsch and Clifton Collins Jr. from the new "STAR TREK" movie.